Belgium’s Deputy Prime Minister Alexander De Croo announcing partnership with Bill & Melinda Gates Foundation and the World Health Organization to eliminate neglected tropical diseases in Africa. JOHANNESBURG, South Africa, 5 December 2018,-/African Media Agency (AMA)/- Leading philanthropists as well as African and European governments have announced more than US$150m to tackle neglected tropical diseases largely unknown in western countries, but which affect 1.5 billion people – or one in five on the planet. The over $150m funding will unlock a total aid package worth many, many more times that sum thanks to the free donation of medicines from pharmaceutical companies. The event, called Mandela100 to honour Nelson Mandela, the anti-apartheid icon, in what is the centenary year of his birth, featured international artistes including Femi Kuti, Sho Madjozi, Beyoncé, Jay Z and Ed Sheeran, amongst others. 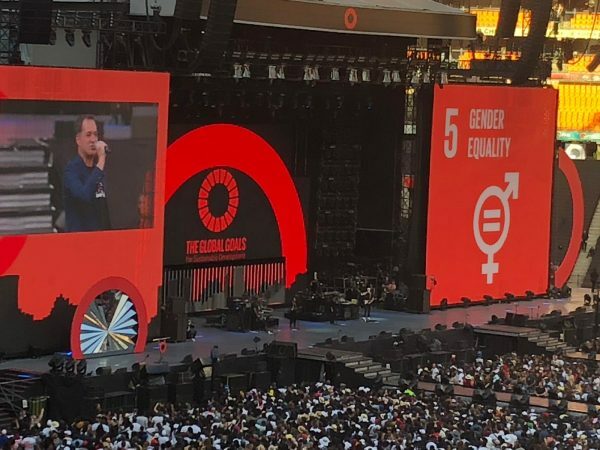 As with other Global Citizen events it was a unique mixture of fantastic music, speeches by politicians and messages about how to solve some of the problems of the world. A total of nearly US$150m in funding for neglected tropical diseases (NTDs) was announced at the concert, where total commitments worth over $7 billion dollars to support the UN Sustainable Development Goals were also announced. Thanks to pharmaceutical companies donating medicines for NTDs for free, the $150m pledged at the Festival will unlock a total aid package worth many, many times this figure. For every aid dollar invested in the distribution of medicines, $26 worth of donated drugs will be leveraged, making this the largest public/ private partnership in global health. Precious Mukelabai addressing the crowd at the festival. A group of private sector philanthropists from countries around the world — including those endemic for NTDs like Zimbabwe and Nigeria — announced $15.5m to the total pledged at the festival. This money will allow the private philanthropic initiative, the END Fund, to continue its work investing in the fight against neglected tropical diseases. “In honour of Nelson Mandela I pledge on behalf of the government of Botswana to prioritise the prevention and treatment of all neglected tropical diseases and to provide the domestic resources necessary for their elimination. In line with this commitment, Botswana has begun the treatment of over 230,000 children in need of treatment for those diseases”.